... from our family to yours! A most Blessed Christmas to you and your family too, Jessica! did you guys get all dressed up just for the picture or are you actually going to Mass today?? Just beautiful! Peace, love, and joy! No Regina -- this wasn't taken today. 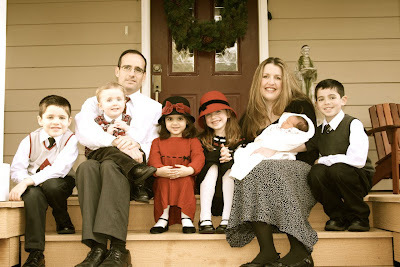 It was taken this past Sunday after Mass and was our first attempt at using the tripod for a family picture... 5 days after delivery no less... but it's better than nothing! We needed one for Christmas Cards, which . Christmas cards! It may be awhile before I get them all out! As for Christmas Mass, we will be going in the morning. Merry Christmas! Lovely, lovely picture! Merry Christmas and many congratulations on your Christmas Rose! Merry Christmas to you, as well! Your family picture turned out beautifully! You are such a blessing to mothers and families! Thanks for all you hard work sharing ideas and posting links. (I just started blogging not too long ago and it takes forever!!) I so appreciate you and your websites! Thanks again and God bless! Merry Christmas to you and your wonderful family. I hope you all have a fantastic new year as well. Oh, Jessica, what a gorgeous picture! I second Melissa's thanks on sharing photos, links, etc. I really have no idea how you manage to do all you do - you are definitely SuperWoman! Wishing you and yours a merry and blessed Christmas. Merry Christmas to you and your beautiful family! I pray that you all enjoy your first Christmas with your Christmas Rose! A blessed Christmas to you and your family, Jessica! A very Merry Christmas to you and to your family, Jessica. And a deep heartfelt thank you from the bottom of my heart for all the inspiration you provide. The picture is fantastic! Blessed Christmastide to you and your beautiful family, Jessica! Great picture! A blessed Christmas to you and your very beautiful family as well, Jessica! Beautiful photo! Beautiful family! Merry Christmas to you too. May God bless you abundantly through out the rest of the year. A beautiful Christmas photo. How Happy you all look and that sweet Christmas Rose is just adorable. Praying you had a peaceful Christmas.